Paige is getting to the age where she wants to know everything. We are trying to teach her as much as we can. We are currently teaching her the alphabet and she loves learning so much. I can't wait to start teaching her about time. She always asks when and I cant wait to tell her a time instead of after lunch or after nap time. To help with teaching a child time Room To Grow have some lovely clocks that are simple, easy to read and big. We were sent the Carib glass wall clock in black to try out. As Paige is still a little young to be telling the time the clock lives in the kitchen right now, above our command centre. It is in the perfect place for me to be able to see and also Paige. We have an open kitchen and living room so Paige spends a lot of time in that area. The numbers are clear, big and super easy to read. I especially find this helpful as when I don't have my glasses on I can still see the time very easily. The contrasting colours also make the clock really easy to read. The clock is made from coloured glass but isn't really heavy. The hands are chrome which gives the clock a really modern finish. I really love the look of this clock and I think it would fit in well in most houses. It is also available in a lime green colour if black is a little boring for you. It takes 1 AA battery. It does have a loud tick too it which would drive me mad if it were in our bedroom but as it's in the kitchen there's normally so much other noise that I don't notice it. 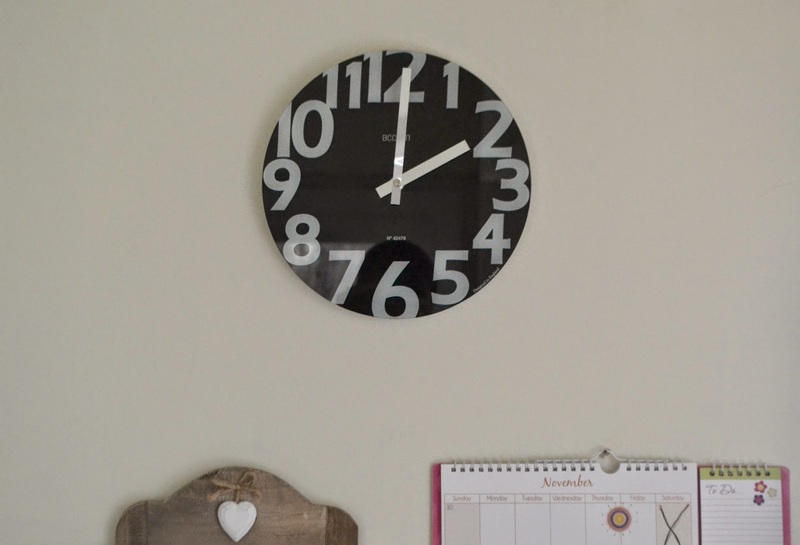 The clock retails for £22 but is currently on sale at £19.80. In all honestly it is a little more expensive that what I would normally pay for a clock but for the style and look I think its a good price.